Get it before September 15th for a $1.00 discount! The year is 2790 AD, and this is the Second Cold War. With space elevators and giant orbital fleets hovering over Earth, open war looks inevitable, and people are anxious to get away. The lines are drawn, with the communist Confederacy in the East, and the free citizens of the First World Alliance in the West. 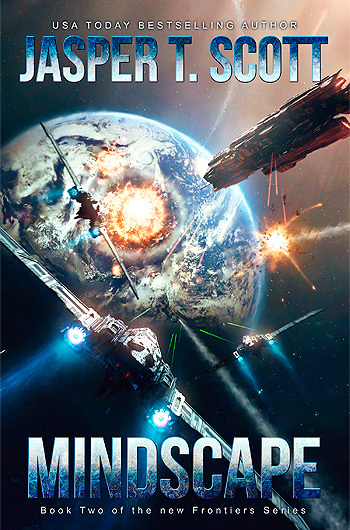 In hopes of finding a refuge from the looming war, the Alliance is sending Captain Alexander de Leon to explore an Earth-type planet, code-named Wonderland, but at the last minute before launch, a Confederate fleet leaves orbit on a trajectory that threatens both the mission and Alliance sovereignty. The resulting power struggle will determine not only the fate of Alexander's mission, but the fate of the entire human race. (*1.00 Discount for Pre-Orders. Equivalent price and discount applies for non-US customers). I know I said the beginning of March, but my wife was recently hospitalized due to complications with her pregnancy. Thankfully all is well so far, but I'm adding a few extra weeks to the release date so that I can be here for her in the hospital. As for the book, it's looking to be a very good story with a nice twist. It is a standalone book, although there's room for a sequel, and I am planning to write one. By popular demand the swear words in this book are not euphemisms as they were in Dark Space, and the science is much more evident throughout. This is a hard science fiction novel, but stylistically still a great fit for anyone who enjoyed Dark Space.